That is basically exactly how they are described in CiLR. I'm pretty much completely certain that they are supposed to be arrogant jackasses, rather than as pure as they claim. This. A hundred times this. Lunarians are basically Touhou's version of elves. -Pretty? Kind of a given in Gensokyo, but Kaguya is noted as extra hot. Check. -Incredibly smug about all the above? Check. They even have their very own Slutty Lesbian Elf Princess. Last edited by Jm2c; 2010-11-19 at 09:15 AM. Agita on the MinMax boards. Classy Psion avatar by Prime32. Most Vile loli this side of Mariko, also by Prime32. As a side-note living on the moon would make people taller and weaker, and slow the visual effects of aging. A medieval person somehow transported to the moon might believe that he had entered a magical realm which granted him superhuman strength. Last edited by Prime32; 2010-11-19 at 09:25 AM. I'm pretty sure he would be too busy freezing and asphyxiating to really think about having super-strength. And once you enter the magical realm of the Lunar Capital i think all bets are off regarding the effects of the ordinary physics of the Moon. I mean they have a proper atmosphere and time stops working normally there. I'm pretty sure he would be too busy freezing and asphyxiating to really think about having super-strength. Okay, assuming there's air in a dome or something. Thought I should post these here. 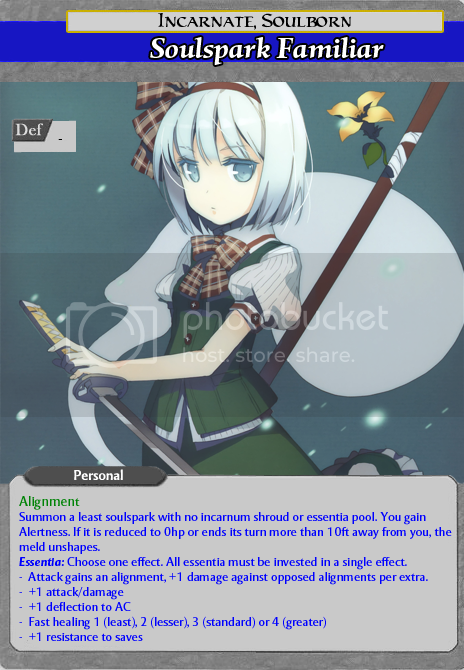 Remember the 4e Touhou Power Cards? Last edited by Prime32; 2010-11-20 at 05:35 PM. What are those? And who's the second one from the top? I think those they are cards representing the powers in 4e D&D, kind of like spell cards. 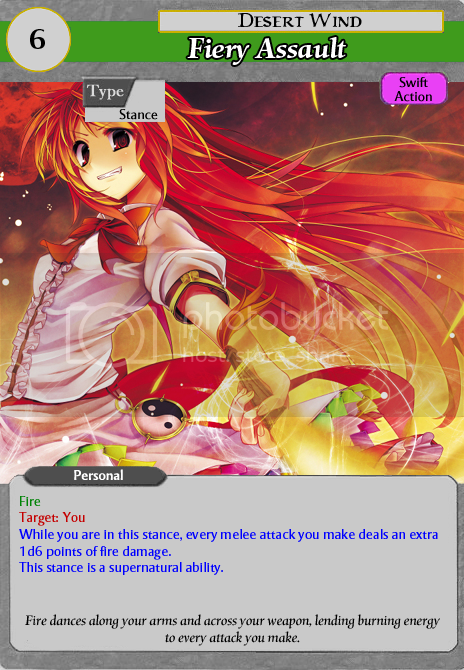 The character on Burning Brand and Fiery Assault is Tenshi, although I cannot explain why the Tenshi on Fiery Assault has red hair. D&D 3.5 manouver cards for Tome of Battle. Also some Incarnum with Youmu. I suppose it's 2P Tenshi or a weird lighting effect. The artist seems taken some liberties with the multicolor sash and general dress design. Would be neat to have a full set. Last edited by IncoherentEssay; 2010-11-20 at 05:40 PM. It is more of a disclaimer than a name. Essay, Inc., or the like are all fine as shorthand. Things i made from clay, wire & paint. An opportunity to have your a bust of your character sculpted, details at the end of this post. Creatively inclined? Join the Playground's CHALLENGE! Up your productivity today! I'd appreciate any suggestions on images for other maneuvers. Last edited by Prime32; 2010-11-20 at 06:06 PM. 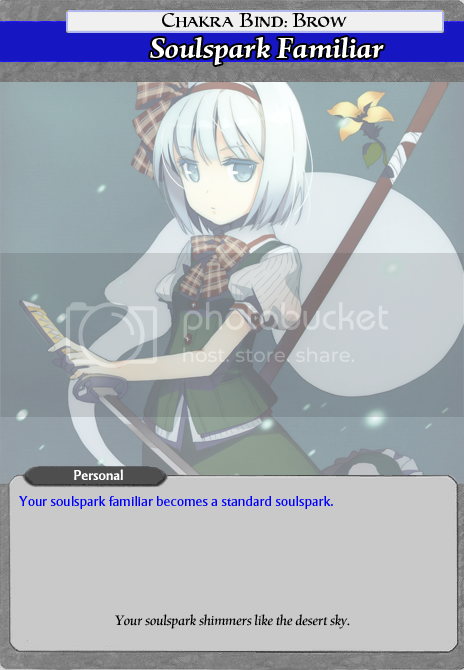 I imagine you could make pretty heavy use of Sakuya for the Diamond Mind set. Actually, Alice would work really well for White Raven too. For Devoted Spirit, you could probably use Reimu, Sanae and/or Byakuren pretty easily. Last edited by Rolaran; 2010-11-20 at 06:06 PM. Patchouli Knowledge avatar courtesy of the skillful Prime32. "The first person to prove that cow's milk is drinkable was very, very thirsty." Are there maneuvers that do charisma damage? Because if so, Remilia would be interesting because she has taken such damage several times. 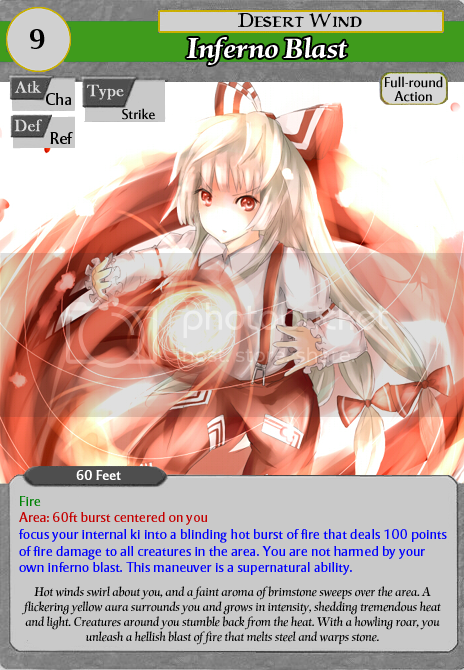 Meiling, Suika, or Yuugi would be a good choice for unarmed maneuvers. Desert Wind: Between flight and fire, this one's a no-brainer. Mokou, maybe Utsuho. Devoted Spirit: Sanae or Byakuren. Reimu's more... technically religious. Loosely. Given the whole faith basis for it all, she doesn't really fit. Sanae's a good match, though, what with all the smiting. Diamond Mind: Sakuya, no doubt about it. Cirno's a close second. Iron Heart: Youmu. If it wasn't for Sakuya, she'd be a decent Diamond Mind candidate too. Setting Sun: Wow. This is... tricky. I don't know. Satori, maybe? Kinda hard to use any attack that she won't predict, after all. Shadow Hand: Yukari could fit the bill here, but Nue would do better, I think. Reisen would be a surprisingly good fit too. Or Rumia. And I guess Kogasa could be Shadow Hand, too. Or just trying and failing. Stone Dragon: Another one with lots of candidates. Yuugi and Suika are obvious since they're both tough as nails and hit like a freight train. Plus, Suika has a rock-chucking move. For similar reasons, Meiling is another candidate. Alternatively, if you want to focus on the stone connection, there's Suwako, Tenshi or, uh, giant catfish. Tiger Claw: Another tricky one. The closest thing to "obvious" candidates are Meiling (unarmed), Remilia (just seems fitting, for her somewhat angrier, melee-y moods) and Shou (tiger). Lastly, White Raven: Byakuren seems like a decent leader sort. Nazrin, too - commander, after all. Sakuya/Remilia are debatable - bossing people around all the time has to count for something. Mind you, by that logic, Kaguya could be on this list too. Kanako seems to be placing a fair bit of emphasis on dealing with people, too, so that's not implausible. Mind you, they might as well all step aside since Alice fits the role best by far anyway. Setting Sun is mostly supernatural Judo. I'd say both of the cast's martial artists would work. Last edited by Drascin; 2010-11-21 at 03:43 AM. It's less about character<->style association and more about finding fitting illustrations for specific manouvers, though. Setting Sun is probably one of the harder ones to cover, since it's rather unlikely to find pics for the throwing manouvers outside the occasional suplex-meme. Satori doing the caramelldansen is perfect for the Baffling Defense counter though . Last edited by IncoherentEssay; 2010-11-21 at 04:43 AM. Who's the best character to 1-credit Embodiment of Scarlet Devil? I've been using Marisa-B, but that tends to give me problems against regular enemies. Also, any advice for how to dodge Sakuya/Remilia? Last edited by dragonsamurai77; 2010-11-27 at 02:38 PM. As a rule, in almost every game, Reimu tends to be the best character. 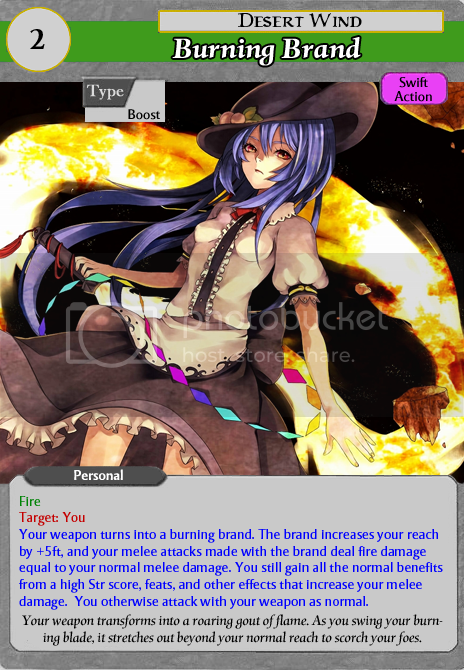 As for dodging Sakuya/Remilia, each spellcard has its tricks. Do notice that Misdirection is very easily passed by staying still a lot, IIRC. What cards give you particular trouble? I've been using Marisa-B, but that tends to give me problems against regular enemies. Take advantage of that speed to camp the hell outta enemy spawns if you ask me. I like using Marisa-B too, mainly for Love Sign ~ Master Spark, but I think Reimu-A is good for eliminating minor enemies if you don't want to move much, while Reimu-B is good for taking out enemies quickly, but makes the fourth stage somewhat harder. I prefer MarisaA in EoSD. I typically favor more power over anything else. I happen to prefer Marisa B for the Master Spark. But Reimu A was really easy in comparison. Admittedly, it's not a fair comparison because I cleared Extra mode with Marisa before using Reimu at all. It all depends on your playstyle really. I mainly use Reimu-A (or whatever the Homing shot type is) in every game since I like how the homing shots let you not have to worry about positioning to damage things. I'm just too used to Reimu that I can't really do anything as the other characters. Like what everyone else has said, the main draw of Marisa-B is probably Master Spark. Not only is it obscenely powerful, it's apparently also a great way to get point items for high scores. Going with its power, you might be able to just bomb spam Sakuya to death to save your lives for Remilia, but that's probably the "less skillful" way of doing it. To me, it seems like there's really nothing else to do to get better other than practicing to spot patterns and safe areas. Last edited by EifieFlare; 2010-11-27 at 08:44 PM. Other than that, my main problem seems to be that I'm too conservative against Meiling and Patchouli, and stages 4 and 5. I had the start of a collaborative storytelling thing ready, and I was going to post it on BG but the site's down. So I suppose I'll post it in FFRP. Would anyone be interested? Last edited by Prime32; 2010-12-08 at 01:20 PM. What's free form roleplay? Depending on the answer, quite possibly. As I said, this would be collaborative storytelling. Any participant can advance the story - characters aren't assigned to players or anything like that. Last edited by Prime32; 2010-12-08 at 01:48 PM. Considering how maybe 99% of the stuff out there related to Touhou is fanmade, I think alternate characterizations in this series are pretty much a given now. If anything, we could just blame the forbidden template and roll with it. Most people suspect that one of the reasons ZUN didn't give each character set personalities was to allow for alternate character interpretation anyway. He's pretty accepting of the theories too, or at the very least doesn't mind it. I meant consistency between players. We don't want Shikieiki cheerfully greeting Reimu in one scene, and threatening to send her to Hell for not bowing before her in the next. Last edited by Prime32; 2010-12-08 at 05:34 PM. Last edited by EifieFlare; 2010-12-08 at 06:47 PM. I was going to say no major original characters (ie. no-one particularly powerful or important to the plot), and nothing which requires introducing new locations or aspects to the cosmology.